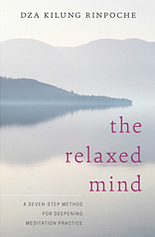 The Relaxed Mind, a Seven-step Method for Deepening Meditation Practice, published by Shambhala Publications in 2015, contains instructions for the seven-phase meditation practice that Rinpoche developed for Westerners. It’s very traditional but adapted to help those of us who live in a culture of distraction. The method is a way for meditators to relax and deepen their practice—but it’s also an excellent meditation manual for any beginner. You can purchase the book, and read more about it, from Shambhala Publications or from Amazon. Discovering the Relaxed Mind – An Immersion in a Seven-Step Method for Deepening Meditation Practice. Click HERE for more information. Wisdom Publications has just released a podcast of Kilung Rinpoche discussing “Jigme Lingpa and the Longchen Nyingtik Tradition” with Daniel Aitken. Click HERE for the link. Kilung Rinpoche is a featured teacher in Weekly Wisdom, a series of free mini-teaching series from leading spiritual teachers offered by Shambhala. More information available here.